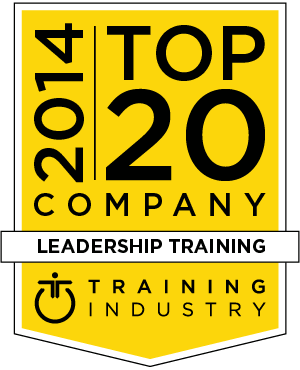 As part of its commitment to continuously monitor the training marketplace for the best providers and services, TrainingIndustry.com has released its 2014 Top 20 Leadership Training Companies List. Miller Heiman Group helps companies and their business leaders around the world build and sustain customer-focused, high-performance organizations to drive profitable revenue and predictable top-line growth. The product of a merging of AchieveGlobal and The Forum Corporation, AchieveForum’s legacy includes hundreds of clients across more than 50 countries and the capabilities to address the most pressing leadership development challenges. AchieveForum partners with clients to design and execute leadership development solutions that drive business results. Duke Corporate Education (Duke CE) is a global provider of corporate learning and development services. Duke customizes solutions that enable leaders to adapt and move the organization forward. Interaction Associates (IA) is an innovator helping global organizations build collaborative cultures and achieve excellence in a new measure of ROI where employees go “beyond engagement” to share responsibility for business results. Since 1969, IA has developed leaders at all levels by focusing on building proficiency in collaboration, strategic thinking, and self-awareness. As part of our commitment to continuously monitor the training marketplace for the best providers and services we announce the 2014 Leadership Training Companies Watch List. The 2014 Leadership Training Companies Watch List is intended to help buyers of training services evaluate leadership training providers. All Psychological Associates’ education and training are developed around a Q4 Dimensional Model. The model provides a behavioral leadership style that gets past roadblocks and generate effective relationships at work. In management roles, it helps leaders learn how to deal with difficult people and situations to achieve desired results. Partners In Leadership is a provider of accountability training and consulting. Partners In Leadership has enabled thousands of companies in 106 countries to achieve dramatic results—breakthrough growth, record-breaking profitability and shareholder returns, reduced costs, and implementation of previously stalled organizational initiatives. Emerge Leadership Group is a research-based training and consulting firm focused on talent development. Emerge offers solutions in leadership, new first-line leaders, experienced first-line leaders, executive leadership, and more. Soderquist Leadership is a provider of leadership development for organizations of all sizes, dedicated to developing values-based leaders around the world. Soderquist Leadership’s goal is to help leaders maximize their strengths, identify blind spots, and take their performance to the next level. Founded in 2002 by Kevin Cope and Stephen M.R. Covey, Acumen Learning is a leader in client-specific business acumen training, having taught their Five Business Drivers Model to 16 of the Fortune 50 and top companies from around the globe. Eton Institute is a provider of learning and development solutions. With Eton, companies and organizations can design a training curriculum that is entirely customized to meet their needs – from content to delivery method. Tailor-made training programs offer a cost-effective solution to employee development and guarantee return on investment. Wronski Associates works with companies to design and deliver learning experiences that develop and retain talent. Their leadership programs for new hires, mid-managers or senior executives include business and leadership skills using assessments, case studies, action learning, live projects, coaching, e-learning, onsite delivery and simulations. CGS is an applications, enterprise learning and business process outsourcing company. CGS develops powerful, hard-working solutions that strengthen and fortify the fundamental business processes that empower clients to take on present and future challenges and opportunities.